Articulate Presenter lets you set default options related to publishing courses and recording narration. There are also general options for saving, previewing, and updating. Go to the Articulate tab on the PowerPoint ribbon, and click Options. Select the Publish tab on the left side of the window. Slides without audio, video or animation display for __ seconds: This determines the duration for slides that don't have any timed elements. It defaults to five seconds, but you can change it. Just enter a value in the field provided. On mouse click animations without set timings display after __ seconds: This determines the number of seconds between animations that are set to occur On Click. It defaults to five seconds, but you can change it. Just enter a value in the field provided. You can also override this setting by synchronizing your animations. Enable publish for manual uploading to Articulate Online: If you use Articulate Online to host your content, you'd normally publish and upload your content all at the same time. But if you need to publish to your local hard drive first and manually upload your content later, mark this box. See this tutorial to learn more about manually uploading content to Articulate Online. Include slide master behind interactions: Mark this box to show your PowerPoint slide master behind embedded Articulate Engage interactions to give your course a consistent design. Tip: For this feature to work properly, you also need to make the interaction background transparent in Engage. Select the Other tab on the left side of the window. Show notes pane on narration window: Mark this box if you want to use the text from the PowerPoint notes pane as a narration script while you're recording. Record narration for one slide at a time: Mark this box if you want to record narration one slide at a time. Uncheck it if you'd prefer to record narration for multiple slides without stopping. Launch Record Narration in full screen mode on large monitors: Mark this box if you want the Record Narration window to fill your screen. If you uncheck it, the Record Narration window will lock to the right side of your primary monitor, and it'll only take up a portion of your screen. Automatically save changes: Mark this box to auto-save your changes as you design your course. Presenter will automatically save changes each time you click any of the actions on the Articulate menu in PowerPoint. 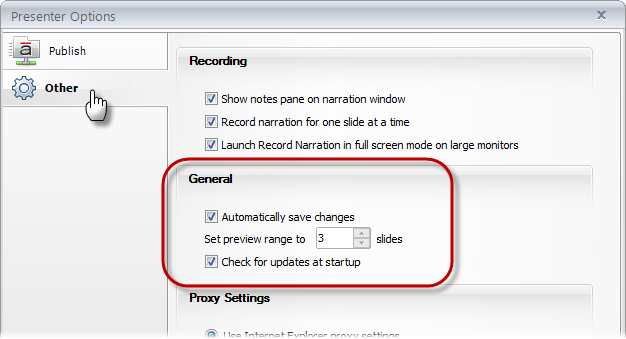 Set preview range to __ slides: This setting controls the second option on the Preview drop-down (Preview Next __ Slides). Three is the default preview range, but you can change it. Just enter a value in the field provided. 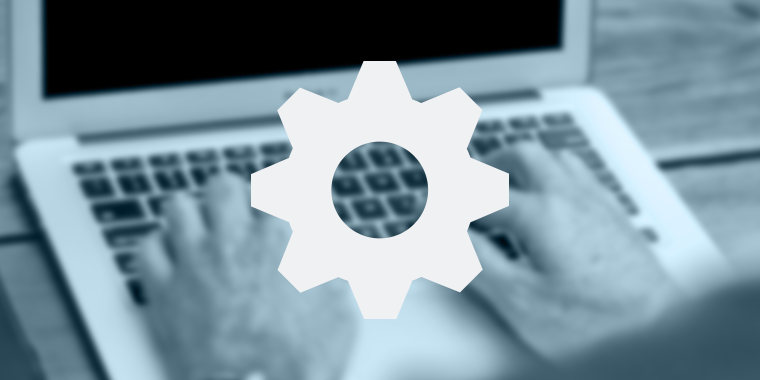 If your organization uses a proxy server, you may need to enter your proxy settings to publish properly. Check with your IT department if you're unsure about whether you need to do this, or if you don't know the address and port information. 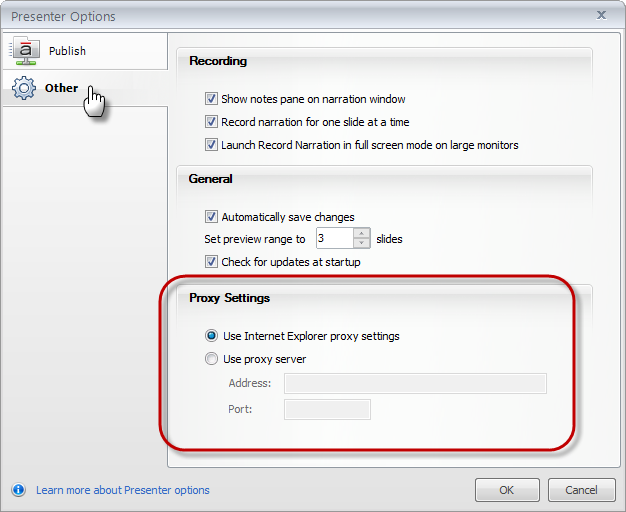 In most cases, you can leave the default option selected (Use Internet Explorer proxy settings). If your organization requires different settings, select Use proxy server, and enter the Address and Port information.